To hire or not to hire: that is the question. It’s rewarding to landscape your yard yourself. Hands-on outdoor projects allow you to reconnect with nature, control the proceedings, and take pride in a job well done. Some complex projects, however, may require professional help. For that reason, it’s wise to consider your budget, time, level of experience and the level of difficulty involved before deciding to DIY. Take advantage of Delhi’s convenient designscape consultations and we can help you decide if it’s a DIY project or time to call in the professionals. Delhi provides consultation and design help. For larger installation, we recommend the area’s top landscape companies. Like any home project, landscaping requires a budget. Deciding whether or not to hire a professional involves crunching the numbers and evaluating which option would be the most realistic and economical in the long run, given your particular circumstances. The good news is that landscaping may appear costly on the surface, but it’s an investment in your home that can save you money in the long run. A beautiful yard increases property value. Short shrubs and trees can protect your house from wind, lowering heating expenses. Likewise, plants shading air-conditioning units can reduce cooling bills. Those who DIY are often trying to keep costs down, and there are numerous ways to go about that. Save money by working with what you have, making the most of it instead of ripping everything out and starting over. Landscaping priorities are improving the quality of soil and adding trees, tasks that amateurs can do themselves relatively inexpensively. You can always compost yourself. To keep costs down, you can also seek out landscaping-related freebies from sources like the city, demolition sites, and even your fellow gardeners. Buy during times of the year when seasonal plants are on sale. Sometimes smaller is better: petite, less expensive plants will often grow to be as big as the more pricey options. Choose varieties that can survive in drier environments to keep your water costs down. Buy native and in bulk. 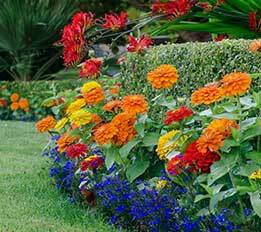 Dividing plants will also give you more bang for your buck. If you want to ensure that things are done right the first time, however, consider professional landscaping services. Even the most well-meaning amateur landscaper can make a mistake; attempts to save money can backfire if they result in costly damage. It’s essential to avoid wiring, cable, phone and water lines, and sprinklers while landscaping, and pros have experience planning and working around these hazards. Planning makes perfect. You will need to develop this strategy yourself if your project is on the more modest side of the scale. Plot out the dimensions of your property, as well as its features and the changes you’d like to make, using a piece of graph paper and a ruler. If you enjoy working with technology, purchasing landscape design software can make this process less painful. Whatever you use to plan, decide which elements of your yard you want to keep and which are no longer working. When considering replacements, take factors like wind direction, sun, patterns of shade, access to water, and maintenance into account. DIY landscaping is for the creative with the time to not only execute, but to dream and research as well. Magazines, books, blogs, and neighbors’ yards can serve as inspiration. There are also rules that need to be discovered and heeded when landscaping, like making sure to plant trees thirty feet away from concrete so the roots don’t do any damage. Meanwhile, pros have the experience, knowledge, and vision to offer reliable, creative recommendations based on the unique features of your property. They’re capable of putting together a sophisticated plan, with many options in mind, given your yard’s size and scale. They also have foresight, taking plant growth and seasonal changes into account. Once a plan has been established based on your budget, landscapers will know the best plants to buy based on your long-term needs. With a plan in hand, it’s easier to assess what you can do yourself and what might require outside assistance. The scale and complexity of your goals will determine whether you should do them yourselves or hire professionals. Small spaces are also easier to tackle than large ones. A few impactful changes, which don’t have to be difficult to implement, can make a noticeable difference. Planting and mulching require time and effort, but most people are capable of doing these tasks, provided that they’re willing to do the research. For DIY inspiration, browse our gardening Guides and Resources, where you can find tips relevant to every skill level. When it comes to big or complicated landscaping goals, it’s especially useful to consult with a professional landscaper capable of developing the complex master plan needed. Contacting professionals with specialized skills is especially necessary if you’re interested in ambitious improvements to your yard such as lighting, irrigation, lawns, swimming pools, hardscapes, outdoor kitchens, retaining walls, French drains, and grading. Expertise is necessary for these projects because mistakes involving electrical work, heights, or digging can result in not only expensive damages, but injury. Furthermore, specific garden styles like English or Japanese—even “natural-looking”—are difficult for amateurs to execute without help. DIY may be right for you if hours spent gardening sounds relaxing and enjoyable. This doesn’t mean you can’t reach out to knowledgeable friends or family who might be able to lend a hand. If hours of outside labor sounds like too much work, hiring a landscaper might be the right choice. If you don’t have a strict date in mind for completion looming on the horizon, you don’t necessarily need professional help. It’s best to landscape in stages if you’re doing it yourself anyways, so you’re spending money incrementally instead of all at once. When timing is a major factor, because you only have so long to improve curb appeal or prepare for a party, pros can meet your deadline efficiently if it works with their schedule.